Campfire songs never tasted so good. This 2007 Children’s Music Web award winning CD sounds like Justin Roberts and Tom Chapin on a musical camping adventure. Great fun for kids 4 – 10. Tommy Paxton brings his Snowmass Village, Colorado weekly family campfire show to you living room (or family van). Tommy has chosen ten of his favorite songs…this collection is 100% dancable, singable, interactive and just plain FUN. Tommy Paxton originals are mixed with familiar tunes by Geof Johnson, Marty Dread, Glenn Bennett, Bubba Hernandez and Justin Roberts. "My mother, Cynthia, gave my daughter 'S'more Songs' for Christmas. We listen to it almost every day, and I find myself singing the songs even when she's not around. I confess, my coworkers thought I was really strange the day I walked around singing, "Please remember to tie the knot in your pajamas." Looking for something to give the niece or the nephew as a gift? Something decent and worthy of their growing musical awareness; something at their level, but still bangin'-enough to make them want to shake a tailfeather? Something that won't blow your rep as the cool auntie or uncle, but won't get you in trouble with the parents? There are loads of titles for kids in the under-10 set on the market these days, some slick, most savvy, very few with that stuff that makes music memorable. 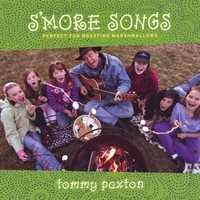 Two that do are "S'More Songs" (paxtonmusic.com) from venerable Aspen musician Tommy Paxton, and "Welcome to Ralph's World" (disneysound.com) from Ralph Covert, leader of power-popsters The Bad Examples. Paxton's is a DIY affair, while Covert gets the full-tilt Disney signature, complete with press kit, accompanying DVD and a seven-city tour. Both are extraordinary examples of how compelling kids' songs can be if performed with passion and conviction (Paxton's "Bob, Bob, Bob"; Covert's "Peggy's Pie Parlor Polka"). For purposes of full disclosure, I played in a high-school band with Paxton and try as we might, we couldn't get him to sing. Listening to him now, it is clear that it was a major opportunity lost. It's like having Tommy come over to your house and sing to the kids! I just LOVE LOVE LOVE "Guess the Animal", I saw Tommy do this song live in front several hundred other Children's Singer Songwriters at a Children's Music Nestwork National Conference. I know he was great live, but I wondered what how he would generate the same "up close, singing with you" vibe on CD, but from the first song, "Gina the Laughing Hyena" he sonds like he brought the party over to house. The kids on the CD great too. Also check out his spin on "Mouse in My House" and "Willie was a Whale". Oh yeah, and I really love the CD title (Tommy is great fun at campfire gigs). Sent two copies to two sets of grandchildren who love to sing in the car and each family said the songs were great fun and the singing together had never been better.